You wouldn’t know it to look around now, but Arkansas, at times in the distant past, was teaming with sharks (and other marine fish). Indeed, Arkansas was in part or wholly covered by ocean many times in the past. One such time was 250 million years ago, during the Carboniferous Period. 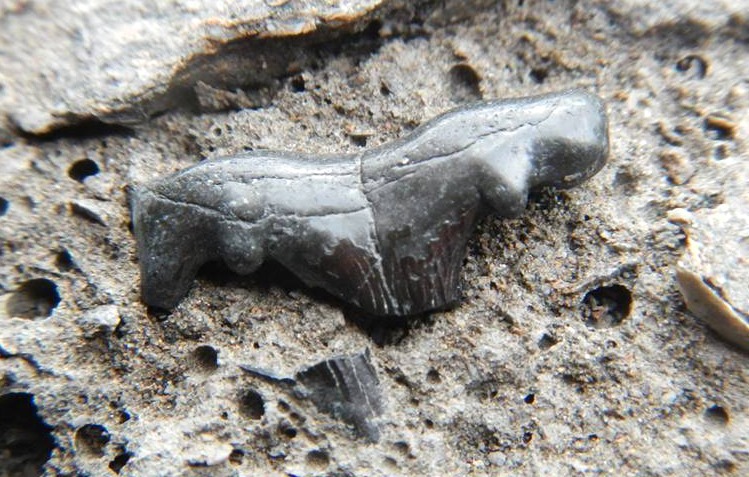 The fossilized Cladodus tooth pictured above belonged to a primitive shark that had sharp teeth with multiple points of varying size that it used to gig fish before gulping them down. The long point at the middle of the tooth is broken off and displaced to the right in this picture. This particular specimen was found near West Fork, Arkansas. It was collected from the Prairie Grove Member of the Hale Formation, a limey sandstone. However, shark teeth can be found locally, throughout other parts of the state, in marine rock layers spanning hundreds of millions of years. 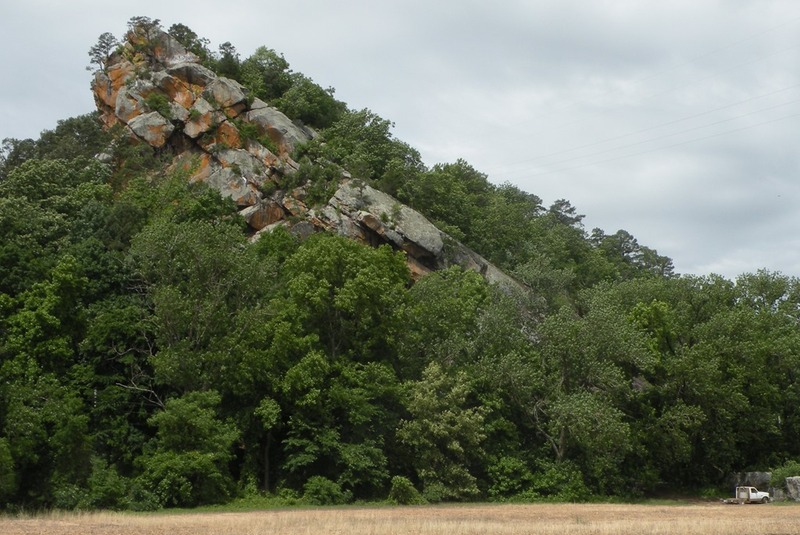 This entry was posted in #geoblog, GeoPic of the Week and tagged Arkansas, Fossil, Hale Formation, limy sandstone, northwest arkansas, Prarie Grove member, shark tooth on March 30, 2017 by argeology. The sedimentary rock in the picture above is a sandstone with pebble molds. If the pebbles were present, this rock would be considered a conglomerate. Conglomerates consist of 2 mm or larger rounded fragments of rock, or clasts, surrounded by finer-grained sediment which geologists call “matrix”. The clasts in the rock above were pebble sized, 2-64 mm, and the matrix is sand sized. Even though many of the clasts have been removed by erosion, we can tell that they were primarily shale pebbles. The sandy matrix was more resistant to erosion than the softer shale pebbles, so we are left with cavities where the pebbles were (pebble molds) on the rock’s surface. This creates an interesting optical illusion. Did you see the cavities as pebbles or as molds when you first looked at the picture? This type of conglomerate is deposited by energetic and dynamic water, such as is found in rivers and waves. During higher flow periods, only large clasts are deposited. When flow is lower, finer-grained sediment settles in between the larger clasts. This entry was posted in GeoPic of the Week, Sedimentary Features and tagged Clastic, Conglomerate, earth science, Fluvial, Geology, Matrix, optical illusion, Pebbles, science, Sediment, Sedimentary, Tidal, Witt Springs Formation on March 2, 2017 by argeology.